The ornate eagle ray is a large ray found in the Western and Eastern Indian ocean, and the Northwest and Western Central Pacific Ocean. As its name suggests, this species possesses decorative patterns of stripes and spots on its body surface. Very little information is available about this particular species. Eagle rays are generally large rays with winglike pectoral fins (with large wingspans as their name suggests), and this particular ray can reach up to 7.87 feet. The tail of eagle rays often looks like a whip and can grow as long as the body. 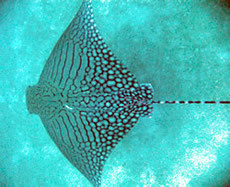 Rays usually have a stinging barb on the tail, but the ornate eagle ray is not equipped with one. Eagle rays are excellent swimmers and are able to jump high above the surface. Compared to other rays, eagle rays have long tails and well-defined rhomboidal bodies. Ornate eagle rays can be found in open and shallow seas, subtidal aquatic beds, and estuarine waters. Eagle rays generally live close to the coasts in depths of 1 to 30 meters (3 to 98 feet) and in exceptional cases, they are found as deep as 300 meters (984 feet). They are most commonly seen cruising along sandy beaches in very shallow waters, the two wings sometimes breaking the surface and giving the impression of two sharks traveling together. Diet consists of snails, mussels and crustaceans, crushing their shells with their extremely hard teeth. This species is viviparous, giving birth to four to six live young. 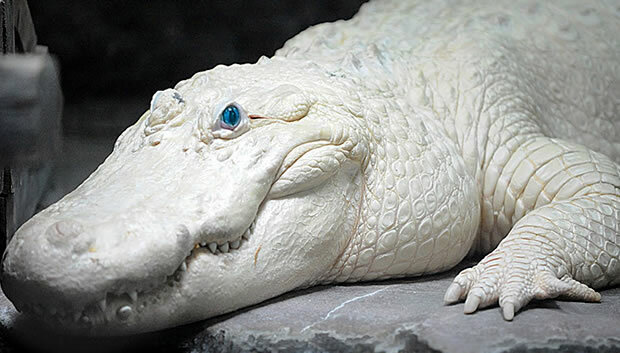 This species is listed as "endangered" on the IUCN list of endangered species. The main threat to the species is accidental capture by fishermen. Copyright Notice: This article is licensed under the GNU Free Documentation License. It uses material from the Wikipedia article "Ornate eagle ray". Glenn, C. R. 2006. "Earth's Endangered Creatures - Ornate Eagle Ray Facts" (Online). Accessed 4/19/2019 at http://earthsendangered.com/profile.asp?sp=1782&ID=3. Need more Ornate Eagle Ray facts?